Axel Douque at Ocean Independence sends confirmation that he's now a joint central for sale of the 32.9m motor yacht FX with Sanlorenzo. FX was built by Sanlorenzo in 2004 to RINA class. Her mahogany interior by Della Role sleeps eight guests in a master, VIP, double and twin and her two MTU 12V 4000 M90 engines give her a cruising speed of 25 knots. 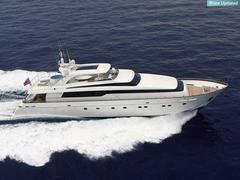 This superyacht is asking €5.25 million.